It is our deep desire that you feel welcome coming as you are, and that after spending some time sensing the presence of God through the Evergreen family, you will be more aware of God’s love for you and God’s profound purpose for your life. Please join us every Sunday morning at 10am, either at Evergreen Church or online via Facebook Live! We may think that if everything went our way, our life (and the world) would be better. But we need not bother thinking that for very long, because it doesn’t. Everything doesn’t go our way. We get hurt by our friends (or we hurt them). Too much snow falls (or not enough). We get sick. Our loved ones die. There is wickedness in the world, and sometimes it comes very close to us (and sometimes it emanates from us). Facing all this (corruption around us and corruption within us) can make us humble. And that’s not bad, because humility can bring us closer to God. Job struggled with this. And by God’s grace, he learned some things. So can we. During these weeks leading up to Easter (this season of Lent), let’s dare to embrace humility. If we do, we may discover the mysterious riches of God. Every person is on a spiritual journey in life; some are simply more aware of this than others. You may be just beginning to recognize this spiritual dimension to life; or you may have been consciously walking the path for years. What matters to God is where we’re heading. Are we actively seeking to draw closer to God? Or are we letting the culture around us deaden our spiritual senses and pull us further away from God? Evergreen Church invites you to come as you are, wherever you are on your journey. 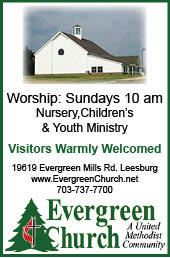 Since our first worship service on October 17, 1999, Evergreen has been and is a church in which individuals and families have grown in their relationship with God – through worship, service and fellowship. After meeting at Evergreen Mill Elementary School for 11 years, and Loudoun Country Day School for 2 more, we moved into our brand new church building on March 10, 2013, located at 19619 Evergreen Mills Road, Leesburg, VA (a half mile past Heritage High School, just outside Leesburg). This is an exciting time for you to come and see what God is doing at Evergreen Church. We worship every Sunday at 10am. Our vision is to experience God, to exalt God, and to extend God to others. In other words, we want to know and love God, acknowledging and honoring God’s rightful place at the center of our lives, and we want to share the difference God makes in our lives with those who don’t know Him.